The expedition collected rocks from more than 1.5km under the surface of the water. In the remote waters of the Indian Ocean, west of Perth, scientists have just discovered two sunken islands, almost the size of Tasmania, which were once part of the supercontinent Gondwana. "The data collected on the voyage could significantly change our understanding of the way in which India, Australia and Antarctica broke off from Gondwana," said Dr Joanne Whittaker, a postdoctoral fellow at the University of Sydney's School of Geosciences. Researchers from the University of Sydney, Macquarie University and the University of Tasmania led an international team of scientists on the voyage to map the seafloor of the Perth Abyssal Plain. The expedition returned to Perth last week after a three-week cruise. Travelling on the CSIRO vessel Southern Surveyor the scientists discovered the islands through detailed seafloor mapping and by dredging rock samples from the steep slopes of the two islands, now in water depths of over 1.5km. "The sunken islands charted during the expedition have flat tops, which indicates they were once at sea level before being gradually submerged," said Dr Whittaker. Collecting rocks from the abyss more than 1.5km below the surface was not easy, but the geologists managed to retrieve hundreds of kilograms and unexpectedly found rocks that showed the islands had not always been underwater. The University of Sydney's Dr Simon Williams, the chief scientist on the expedition said: "We expected to see common oceanic rocks such as basalt in the dredge, but were surprised to see continental rocks such as granite, gneiss and sandstone containing fossils." In the Cretaceous period when dinosaurs roamed the Earth (more than 130 million years ago), India was adjacent to Western Australia. When India began to break away from Australia, the islands formed part of the last link between the two continents. Eventually these islands, referred to as 'micro-continents' by scientists, were separated from both landmasses and stranded in the Indian Ocean, thousands of kilometres from the Australian and Indian coasts. Dr Williams commented: "A detailed analysis of the rocks dredged up during the voyage will tell us about their age and how they fit into the Gondwana jigsaw." 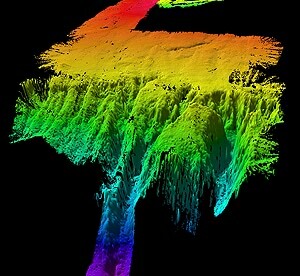 A sonar image of the underwater land masses. Dr Whittaker - who applied for the successful grant that made the expedition possible, but was unable to take part in the voyage due to the recent birth of her baby - said the discovery is a significant development for her field. 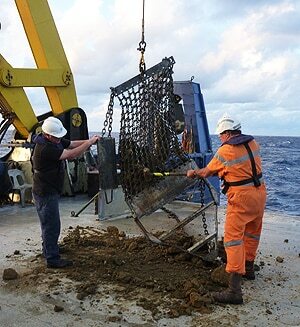 "Our preliminary analysis of the magnetic data that we collected could cause us to rethink the whole plate tectonic story for the whole of the eastern Indian Ocean," she said. The expedition took place aboard the Marine National Facility's Research Vessel Southern Surveyor, which is owned and managed by the Commonwealth Scientific and Industrial Research Organisation, with its operations funded by the Australian government and overseen by a government-appointed steering committee.